The Rottweiler is a large and powerful dog with high protective instincts. Careful selection of a rescued Rottie is important, and a new owner should be well aware of the dog’s history. 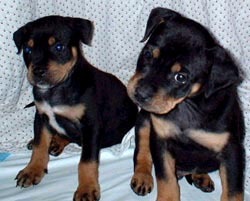 Properly trained Rottie’s are usually tolerant and accept children and other pets, but the emphasis is on training. Their mere size can cause accidental injury to small children. 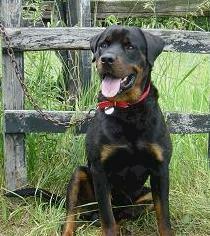 Expect the Rottie to want to be where you are – very loyal and protective of their master. Early training is key for a Rottweiler owner! By its nature the Rottie will try to gain control (just like your teenager), and may even try to intimidate its owner during their early years. The owner must remain firm and in positive control. If done, you will own a “clown” who will be affectionate to almost everyone. If not, you could have a 100+ pound piece of muscle directing your lifestyle. Short Minimal OK for apartment but NEEDS exercise. Needs early training and socilization. Great guard dog.